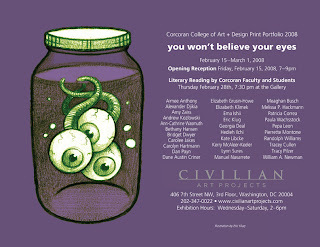 It was opening night at the Civilian Art Project for the 2008 Corcoran Print Portfolio. First - if you weren't there - get yourself there to see it. It's one of the best print shows I've ever been a part of. This year's theme you won't believe your eyes was a fabulous avenue for creative ideas. There are over 30 prints and almost that many different techniques used. Linocut, silkscreen, etching, and lots of wax this year. It's amazing and the gallery space is gorgeous. Another observation I made this evening was that everyone was super supportive of my new role as a mom. Hows that baby? Last time I saw most of them I was looking rather round. Being this little man's mom is more amazing than I anticipated. Watching him become more alert is better than any movie I've seen. Observing him discover his fingers and toes makes me look at mine differently too?!?!? I had no idea that juggling motherhood and just about anything else (including making lunch) would call upon my highest skills as a multi-tasker. I've always liked to keep moving, but motherhood mixed with art work and teaching brings it to an extreme level. Happy six months old Kailen. Mr. Man. Little Man. Zsa Zoo. Sir. Mr Dimples. I'm wild about you. This is not the best picture I have of the two of us but it makes me howl every time I look at it. I think of me holding him - and the camera - and making funny faces at him - and thinking that surely I could capture the perfect moment. And I did. Here she is, with 39 of her closest friends. My latest print begone will be exhibited with about 30 other prints for the 2008 Corcoran print portfolio. This is my fifth year in the show. This years theme is you won't believe your eyes. I can't wait to see how other interpreted it. The first year I participated, I dropped my print off to Georgia Deal and we looked at the stacks of prints that had been delivered for the show. Hundreds of hand printed prints, it was like unwrapping presents. WOW, I felt so honored to be part of that group and have wanted to participate ever since. When I produce this many prints it's impossible not to keep learning and fine tuning my process. I seem to improve my craft in one way or another every year. It's a bear to print such a large edition. Carve, carve, carve. Print yellow, yellow, yellow, and repeat. I start with about 50 sheets in hopes to get 35 good consistent prints. (and five proofs) And even then there are a few wiley ones that creep in. I spent the afternoon signing them and dropping them off. Ahhhh! It always feels great to sign them off and kiss them good bye... I know they're going to a good home. I can't wait to see the entire portfolio at the opening.